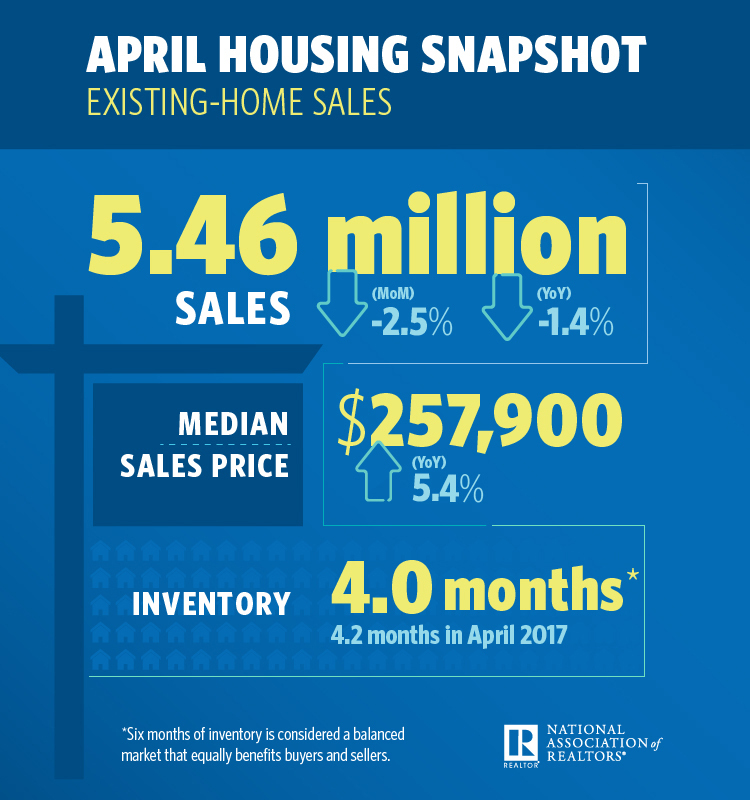 Existing-home sales decreased 2.5 percent to a seasonally adjusted annual rate (SAAR) of 5.46 million in April — down from 5.60 million in March, the National Association of Realtors (NAR) reported today. This month’s sales pace is 1.4 percentage points below April 2017 and marks the second consecutive month of year-over-year declines. 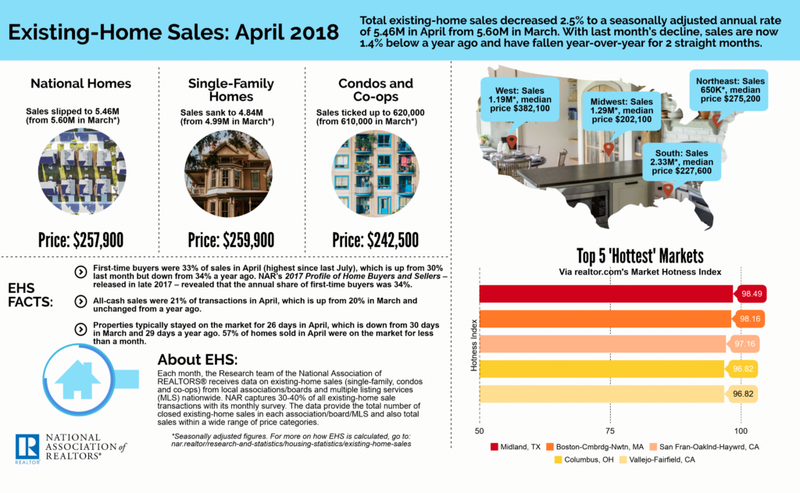 The median existing-home price for all housing types rose 5.4 percent to $257,900, making April the 74th month in a row to see year-over-year gains. Total housing inventory increased 9.8 percentage points month-over-month to 1.80 million homes for sale, while year-over-year inventory dropped 6.3 percentage points. It was the 35th consecutive month of year-over-year declines. Unsold inventory is at a four-month supply at the current sales price. NAR chief economist Lawrence Yun said the slump in existing-home sales is due to dangerously low inventory levels that are simply unable to meet buyer demand. Keller Williams chief economist Ruben Gonzalez says buyers are increasingly growing weary of low inventory matched with exorbitant home prices. Distressed sales, which include foreclosures and short sales, were at 3.5 percent — down 1 percentage point from March and down 1.5 percentage points from a year ago. Three percent of April sales were foreclosures, and 0.5 percent were short sales. Single-family home sales were at a SAAR of 4.84 million — a 3 percentage point month-over-month and a 1.6 percentage point year-over-year decrease. The sales price for single-family homes increased by 5.5 percentage points to $259,900. Existing condominium and co-op sales increased 1.6 percentage points to a SAAR of 620,000 units, unchanged from a year ago. The median existing condo price in April was $242,500 — up 2.8 percentage points from 2017. April existing-home sales in the Northeast fell 4.4 percent to an annual rate of 650,000, and are 11 percent below a year ago. The median price in the Northeast was $275,200, which is 2.8 percent above April 2017. In the Midwest, existing-home sales were at an annual rate of 1.29 million in April (unchanged from March), and are 3 percent below a year ago. The median price in the Midwest was $202,100, up 4.6 percent from a year ago. Existing-home sales in the South decreased 2.9 percent to an annual rate of 2.33 million in April, but are still 2.2 percent above a year ago. The median price in the South was $227,600, up 3.9 percent from a year ago. Existing-home sales in the West declined 3.3 percent to an annual rate of 1.19 million in April, and are 0.8 percent below a year ago. The median price in the West was $382,100, up 6.2 percent from April 2017.